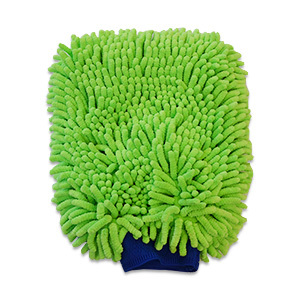 Our Green Microfiber Chenille Wash Mitt, made with luxurious microfiber chenille. This mitt is softer than cotton and more absorbent than sheepskin, giving your vehicles the benefits of more lubrication and fewer swirls. This Microfiber Chenille Wash Mitt is covered in thick, microfiber chenille threads. Chenille refers to the construction of the strands; many fine microfiber threads are bunched together to create plush strands, like yarn but softer. These strands hold a lot of soapy water to lubricate your vehicle's paint as it gently washes away dirt and grime. With plush and absorbent microfiber chenille strands, our Microfiber Chenille Wash Mitt is safe to use on any paint finish, as well as glass and metal. This mitt's construction leaves a lot of room between threads for dirt to migrate. To further reduce the risk of scratching the paint, rinse the mitt frequently as you wash to avoid transferring dirt back to the paint. To get the most mileage out of your mitt, avoid dragging the mitt over emblems with sharp edges. After using the mitt, rinse it out and hang to dry. The Microfiber Chenille Wash Mitt has an elastic cuff, cloth loop to hang it and two sides of fluffy chenille. Properly caring for your auto detailing towels is one of the most crucial things you can do as a detailer. Detail King formulated Micro-Klean, a special detergent specifically for microfiber wash mitts, mops, and towels. Detail King highly recommends this product to extend the longevity of your mitts, mops, and towels. Additionally, Detail King has written several articles on "How To Care For Auto Detailing Towels". These articles give extra insight and proper instructions on the process of proficiently cleaning your auto detailing towels.